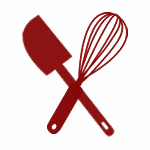 A family cooking and food blog housing over 1200 recipes with photographs and easy-to-follow instructions. Tasty Recipes Straight To Your Email! This is not your everyday cookies and cream ice cream. 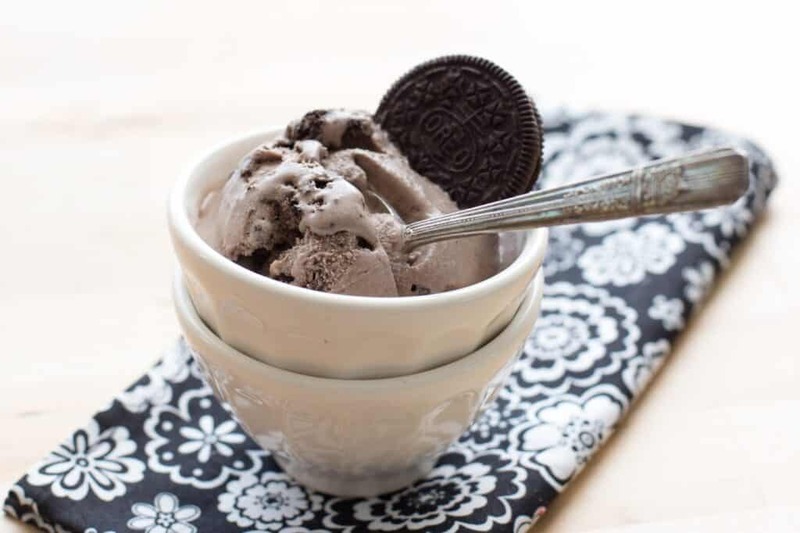 (Although don’t get me wrong, I love a great cookies and cream ice cream!) The base of this ice cream tastes just like Oreo cookies, not like vanilla ice cream with chunks of Oreos. Oreos are a weakness of mine and I have to admit that they are very rarely allowed into my house, because I admittedly have NO self-control when they are near me. There just isn’t a made-from-scratch option that can compare for certain things. I had an idea for an Oreo ice cream a while back and I couldn’t get it out of my mind. I picked up the Oreos at the store and as soon as I got home I dumped a dozen of them into the blender and pulsed them into powder. 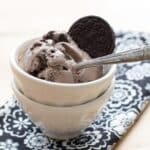 Combining those fine Oreo crumbs with the cream and milk made for a rich, smooth ice cream base that tasted exactly like our favorite store-bought cookies! Place 12 cookies in the blender and pulse to turn them into very fine crumbs. Add a cup of milk and puree until well combined. Add the cream, sugar, salt and vanilla. Puree again until the mixture is smooth. Pour into the ice cream maker and freeze according to the manufacturer's directions. While the ice cream is churning, chop the remaining cookies into bite-sized pieces. (I quartered our cookies.) I've made this with a dozen chopped cookies and with two dozen. My personal preference is for more cookie pieces in the ice cream, although it's pretty darn good both ways. When the ice cream has finished churning, transfer it to a freezer safe container and stir in the chopped cookies. Cover with an airtight lid and freeze until ready to serve. Enjoy! Hi, I’m Mary. I’m the author, cook, photographer, and travel lover behind the scenes here at Barefeet In The Kitchen. I'm also the author of three cookbooks dedicated to making cooking from scratch as simple as possible. Noooooooo this is far too tempting. I like the idea if the actually ice cream tasting like Oreos! 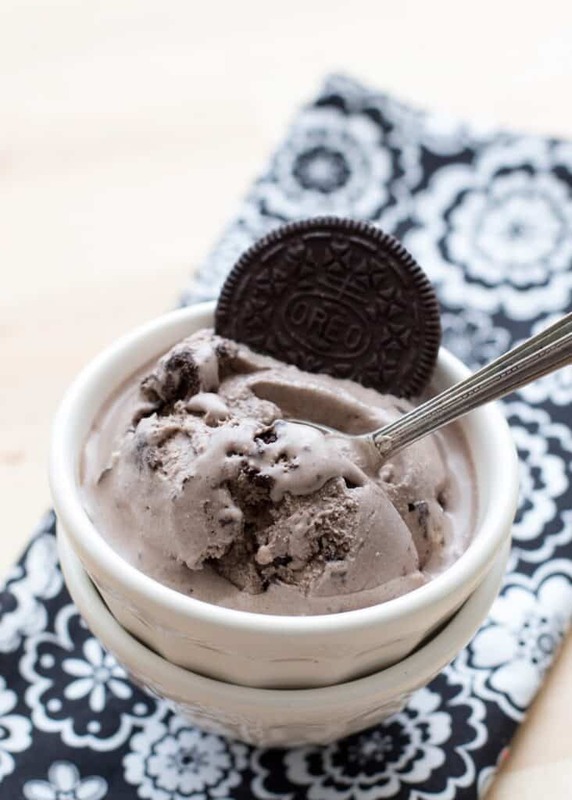 I too love a good cookies and cream ice cream, but your version sounds amazing! I only know one place with ice cream like this; every other place is just fake vanilla ice cream with maybe a couple chunks of oreo in it, and it upsets me because I always thought oreo ice cream was supposed to have an oreo base! I haven't made this yet I am positive it will taste like heaven. Sign Up Here for FREE recipes! Barefeet In The Kitchen is a participant in the Amazon Services LLC Associates Program, an affiliate advertising program designed to provide a means for sites to earn advertising fees by advertising and linking to amazon.com. Please respect my work, recipes and photographs. If you do use a recipe in your own writing, please give proper credit and link back to the original post.